For over thirty years, PRP has been used in many different medical felds including: cardiac surgery, oral surgery, dentistry and periodontal implants, orthopaedics, wounds care, sports medicine, neurosurgery, general surgery and cosmetics. 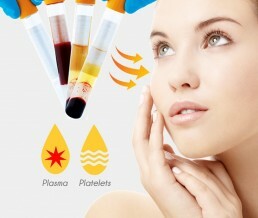 Platelet rich plasma (PRP) obtained from your blood contains platelets which work in the body to repair cuts and tears. Platelets also have growth factors on the surface which stimulate collagen production when injected into the skin. A small amount of blood is drawn from the patient into a sterile tube in the exact same manner as a standard blood sample. The tube containing a patient’s blood is placed into a centrifuge and spun to separate the plasma and platelets from the other blood components. After a few minutes, the plasma and concentrated platelets are removed from the same tube and re-introduced into the patient at the site of the injury, scars, skin, obvious lines or wrinkles. Using a small sterile needle, your physician will inject the PRP in and around the desire site. This is an all accomplished 100 % natural procedure, without using animal products derivative or any other foreign material. Research and clinical data show PRP obtained from the patient’s own blood is safe, with very minimal risk of adverse reactions or complications. Because the platelets are produced from your own blood, there is no risk of rejection or disease transmission. Can be used everywhere on the body, hair loss, after eye laser surgery, face, neck, décolleté, knees, elbows, stretch marks, wounds and scars, tendons and ligaments. Improvement of skin texture and tone are noticeable within three weeks. Full collagen regeneration takes up to three months. Can any skin type or colour have PRP treatment? Yes, PRP treatments can be used on all skin types and colours. No. Swelling from the fluid is what you will see and feel first. Over the days/ weeks the platelets will release the growth factors and pre stem cells which will assist in more collagen growth. Treatment results vary, however, in most patients the results last up to 18 months. Touch-up treatments will maintain the results. Minimal swelling, bruising and redness for 12-24 hours. Some little bruise at the needle site may be visible for 2-3 days. Our leading PRP treatments are carried out in all of our clinics across South London. These are Clapham Junction (Northcote Road), Clapham North, Wandsworth, Chertsey, Earlsfield (TLC Therapy Lounge) and Wimbledon Village. However if you would feel more comfortable in your own home we can offer a mobile clinic that works for you. If you would like to discuss our PRP treatments further please do contact us on enquiries@epicdermis.co.uk or alternatively complete our contact form and we will be in touch shortly. Please remember we are proud to offer free consultations before any treatments take place.